The cabs in Bombay are a trip. 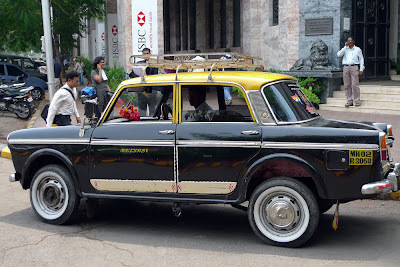 Black and yellow beauties based on an old Fiat body design, manufactured up until 2000 in Bombay by Premier Automobiles. They're supposed to use the meters but if they smell fresh tourist meat (eg., us) they will try to refuse to. 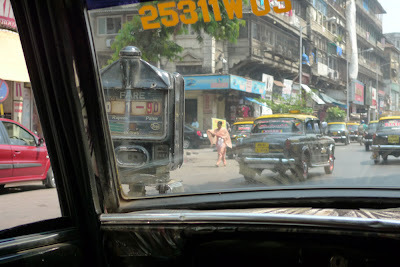 Since 2 of every 3 cars in Bombay is a cab, you can just go to the next one. And then the next one. The meters themselves are unique. They are very analog and mounted outside the car where the passenger side mirror should be. The left hand "100s" digit counts in Rupees. The two right hand digits (10s and 1s) count in Paise. 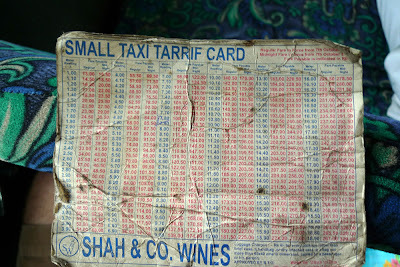 Since Paise are practically obselete as a monetary unit, each cab has a "conversion chart" whereby the fare shown on the meter is multiplied by 13 1/3, or 17 between midnight and 6 am. This makes it practically impossible to determine the correct fare since the majority of drivers either don't carry the conversion chart or refuse to produce it. This leads to much back and forth over mangled mental arithmetic and negotiation of a reasonable, rounded-off fare. Like anywhere, some cabbies are great, some are jerks. One guy refused to name a price for the trip, saying we were guests in his country. We paid the fare shown on the meter (times approximately fourteen) and gave him an unreasonably large tip. Good NY Times Wheels blog post about them here. Apparently they're on their way out, but you wouldn't know it. 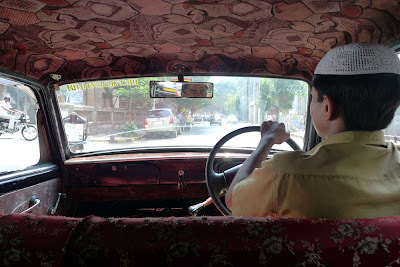 The last one was produced in 2000, and over 25-year old cabs are illegal, so I would say you still have another 10 solid years to visit Bombay and appreciate these beaters in good numbers. Stop looking at me, man.